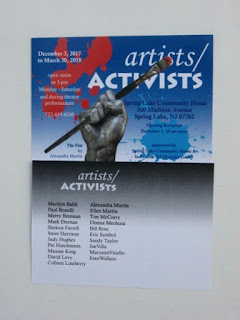 A few days ago I got an e-mail from Pat, the person who had invited me to be part of the activist show in Spring Lake. It mentioned that postcards had been printed up and would be available for all artists beginning on Tuesday, to be picked up at the show location. I spent much of the day at home getting my heat repaired before the winter truly gets here, but that was done by the afternoon. So I decided to go retrieve my cards. Went in the main doors on the theater side of the building. Saw no one around, or at the information desk outside the theater. However on that desk I noticed an open box of the type that usually carries envelopes (I've worked a lot of jobs that involve mailings) and in the front of the stack of envelopes was one with the name of the first person on our list of artists. Flipping through them I found the second envelope had my name on it (the alphabet often works in my favor) and snagged it. Still no one around, and no list of names to check off, but it was clearly my set of cards, so I took it and headed home. The front and back can be seen in the photo below. Still don't know much about the original version of this show, and how many people were in it. The press release I found online listed 15 artists, and this card has 21. It now seems to be called "artists/ACTIVISTS" and I can assume from the card front the show will run until near the end of March. As I said before, the reception will be this coming Sunday from 10 am to noon. I am told that some typical brunch food will be served, so no need to worry about not having time for donuts that morning. I believe I mentioned a little while ago about an upcoming group show in Spring Lake, details to follow once I delivered the work. That happened today, so here is the story. A few weeks ago I received an e-mail from Pat Hutchinson of BelmarArts, with an attached announcement about a show she was recruiting me for- thought I was a good fit. The show is in the Spring Lake Community House, that large brick building on 3rd Ave that currently holds a theater, the town library, and upstairs has some large meeting rooms that have held art shows in the last year. I was in two such shows. Two minor negatives- the deadline for entry had passed a few days before I even received the mail, but Pat was the organizer, so I figured if she was ok with it, I was in. Second was that the show is called "Activism through Art" and they were seeking art of an activist nature. As a general rule I avoid specifically political art, figuring what appeals to the most people is better than something that only appeals to select people. So I replied that I'd think about possible works at my job that night, but meanwhile if she could pass on what piece(s) of mine made her think I was ideal for this show, it could help. Moving Day ended up in its second show of the year, not bad for a piece that dates back to the last century. This one actually does have a political link- made for a show celebrating our then governor's plan to permanently set aside about half of the remaining open space in the state and keep it that way. 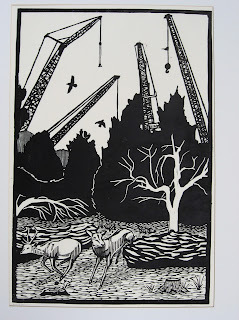 I actually made two prints, this one and a color piece about the frequent conversions of local farms into housing developments. 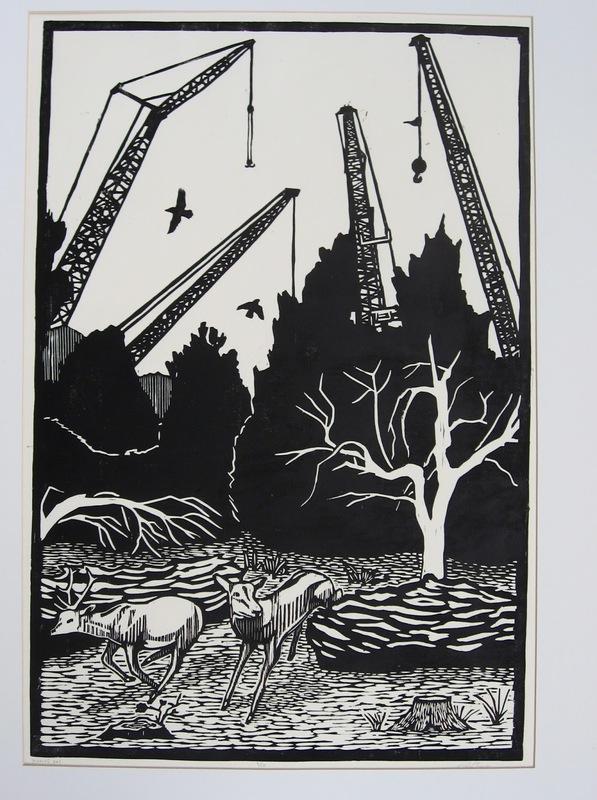 Both pieces were accepted into the show, and the farm one was going to be used in the free magazine advertisement we were offered for the show, until the magazine banned it for fear of offending real estate developers who were their biggest advertisers. (this is one of the reasons I avoid these kind of battles) Not the last time I'd be censored by a business out of fear. The other piece she selected was the above piece from my Ecclesiastes series, not specifically political, but it could be related to a cause. Who can straighten what God has made crooked? is based on a biblical quote and was meant to relate to mental illness, but Pat thought it could relate to the current opioid crisis, very much in the news. 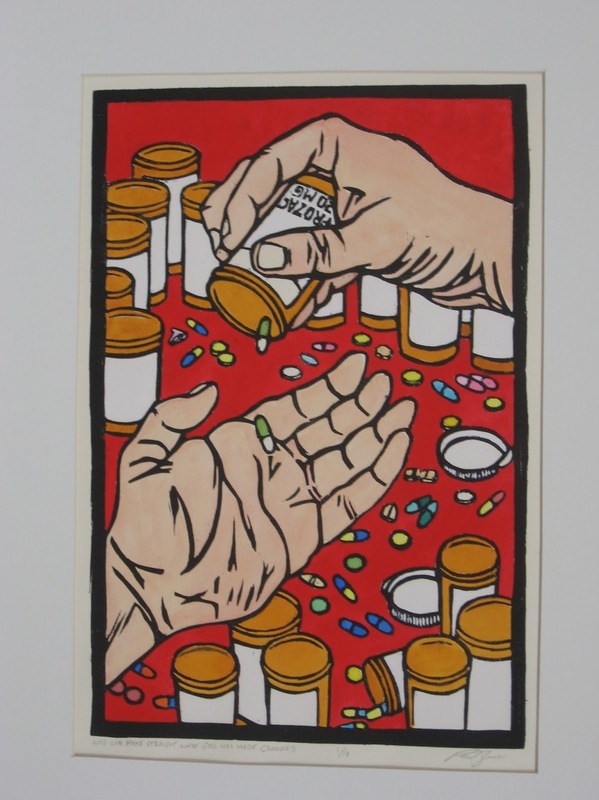 The drug of concern when I made this was Prozac, but the problem of opiates is also real, so I don't mind if this piece sparks a discussion in that area. Normally on Fridays I am up at Kean all day, but today I am off for the Thanksgiving holiday, and the drive to Spring Lake is a lot better than my usual Friday commute. Wrapped in bubble wrap, I got both pieces into my large BelmarArts tote bag, and made a stop there this morning. The gallery space is at the top of a very tall flight of stairs in a building with no elevators, so being able to carry them in a bag with secure handles was a big help. Above is the space that will hold the show. Only a few artists had checked in this morning before me, so I guess there's a lot more art to come. Still a lot I'm not sure about. Some internet research revealed that this show had started as a summer/autumn show in Asbury, it looks like in response to what had gone on in Charlottesville, with those artists invited to be in this one, but obviously additional artists, too. I don't know how many artists or artworks will be in the show. It wasn't organized through BelmarArts. I did find a press release about the Asbury version which listed 15 names, 9 of which I know from Belmar, but Pat wasn't one of them, so I don't know if she had anything to do with organizing the original exhibition, or was just asked to help this one happen. One thing I do know is that the opening reception is on Sunday, December 3rd, from 10:00 am to noon. (I was told that there were too many conflicts with holiday activities to schedule an evening one) And I think it will be up until sometime in March, but I can verify that well before then. Today is Thanksgiving Day, a truly American holiday. Back when I was in grad school in the midwest and we had a large number of foreign born students in town, they found the whole thing a bit puzzling. Once I had to reassure a Scottish born student that pumpkin pie was not as bad as he feared (and he was from a country that celebrated foods that were banned from this country) and that he should try to enjoy it. The main point of the holiday is that we have a lot of food, so let's eat it all, as much as we can. And the classic menu can be adapted to the gathering. One year in grad school, one of the professors invited all the students stranded in Carbondale to gather at his house, and to bring whatever food they wanted, so his turkey and sides were supplemented with homemade lasagne and homemade hummus, to the extent that many were too full to eat any turkey. (not unlike when I was growing up, and the kids would often fill up on ziti and meatballs and have no interest in the traditional courses when they came around) Today the family gathered at my brother's home, where his non-Italian wife helped to prepare a more traditional feast- all very tasty and I can make pasta any time I want anyway, though I took home enough leftovers that it's not likely to happen any time soon. Of course the day is not just food, and I get involved in other traditions, too. Last night I caught a showing of the Charlie Brown Thanksgiving (not as good as Christmas, but not without its charms), and this afternoon part of "March of the Wooden Soldiers" (saved on the DVR, so when I rewatch it, I can skip the boring songs and go right to the comedy and action). Lots of football to watch. But the thing most unique to the holiday is probably the parade in New York, and I caught part of that as well. Watching some of that televised parade this morning brought me back around to thinking about teaching. In recent years I have been assigned 3D design at both my colleges several times, and I am tentatively scheduled to teach again in the new year. 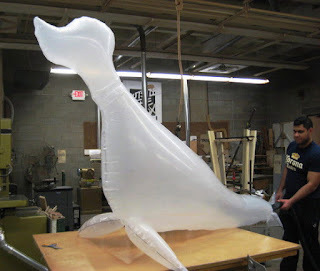 One of my usual projects is to have students make an inflated sculpture using clear plastic drop cloths and sealing tape. Actually a lot of good design lessons to be learned doing that. I take a very traditional approach. They start with sketches, make small models to aid in thinking about how it would all come together, then design, cut the pieces, assemble, and finally blow it up to the full dimensions. Some choose to work individually, while others form groups (I allow up to 3 people on one piece), but everyone manages to get something made. A few students panic a little when I tell them that it must be a minimum of 8 feet long in some dimension, but it turns out it's not that hard to do. I'd enjoy seeing some larger, but classroom space is very limited. So I'm watching the parade this morning thinking making these balloons could be the one practical application of this skill covered in my class. I don't allow the students to make recognizable cartoon characters, and we don't use color, but otherwise it's pretty much the same. In fact, watching this morning, I found myself thinking if my 3D students had enough material to work with, a big enough space to work in, and access to a lot of helium, there's no reason they couldn't have made any of the balloons I saw. I wonder if they think the same thing. Next time I run into some former students, maybe I'll ask them. Yeah it's been a while since I had time in the Studio, or anything else to write about. The biggest obstacle has been work. As we move through the semester, college requires more and more of my time. For example, this past week I had papers to grade, reports to write, a print project to prepare for (I'll admit I like that part), and individual students to help. As for my other job, my last day was a few days ago, so at least that won't be taking up so much time. Some of the things I wrote about early in the month are still evolving, such as the idea of an east/west print show to be held in Belmar. A new item is that I have been invited to put two works into the latest Spring Lake show, so I spent time this week rephotographing the art, writing statements, etc. More details will appear here after I deliver the work next week. Giving me a little more time right now is Thanksgiving. The holiday itself is almost a week away, but it will give me a week off from school, a very welcome break. 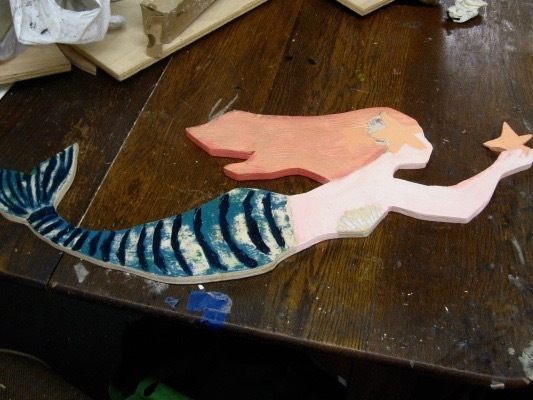 And with that time, I figure it's time to get back to my current project, the mermaid carving. The prints that I made from the block are finished and dry. And I used them and the block to demonstrate my old process to my woodcut student, so now there is no reason not to finish this up. 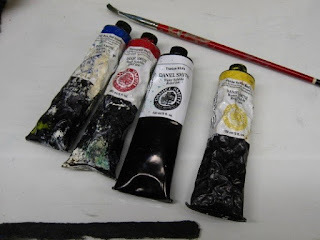 Got up to the Studio in the afternoon and pulled out my supply of vintage water soluble relief ink, technically a collector's item now. Yellow, blue, red, and white will suit my needs today. The last time we saw the block it looked as it does above. The color on it was unintentional, a side effect of the rubbing process I was using. Not intended, but not a problem as I knew I'd be coloring over it eventually. It does give a clue to where those colors will be. As with the prints I was making from this thing weeks ago, this will be a multistep process. I'm using water soluble relief ink, which I figured was the ideal thing to use on a wood surface, at least of what I have in my possession. And mixing those colors is pretty much the same as mixing paint. This first step will all be done with a paintbrush. I started with the skin, on arms/hands, face, and torso. Took the leftover skin color and added yellow and red. 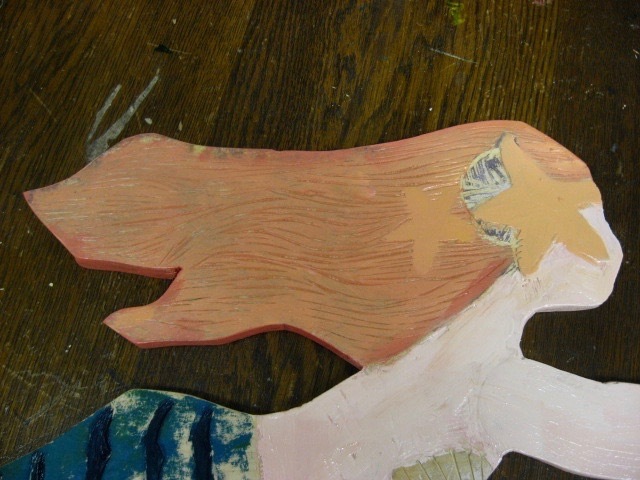 At first it was used to do the two starfish, then more of the yellow and red were added to make the base color for the hair. Used the brush to work it down into all the lines I had cut through the hair. On all the parts with skin and hair, I used the brush to add the appropriate color to the edge of the birch wood. 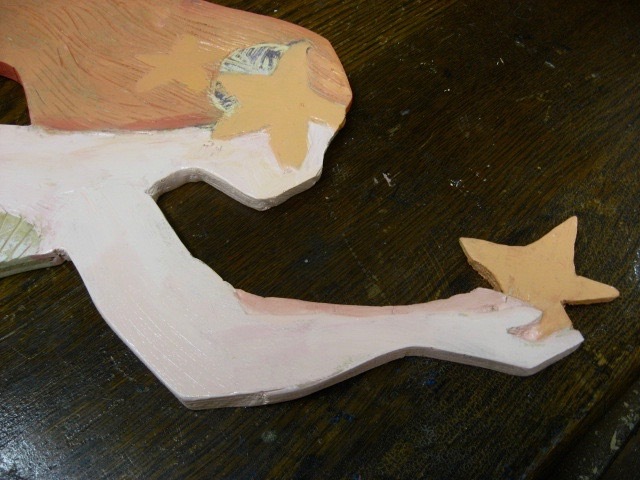 Don't yet know how this will be hung, but I assume the wood edges will be seen. 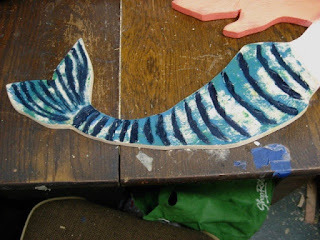 There are serious grooves cut into the tail as well. Into those grooves I painted a dark blue color, straight phthalo blue ink. After all of today's ink dries (it's thick so it may take some time, despite being water based ink), I will use hard brayers and thin ink to add light blue-green ink to top layer of the mermaid tail, and lighter highlights to the mermaid's hair over all those darker parts in the grooves. 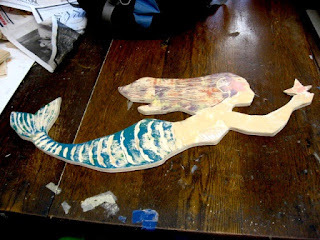 At the end of the session, I had the mermaid sculpture to this point. I decided to save the sand dollar and shell until the other ink is dry, so as not to contaminate the colors, and that can be easily done with a brush at that point. The hair and tail definitely need to dry before the next phase, which will take advantage of the relief surface and be rolled on with a brayer, the darker ink down in the grooves acting as shadows. Several days ago I was at my parents' house and picked up a section of the Asbury Park Press. Opened the page and was hit with some unexpected news- the story of the passing of Douglas Ferrari. Doug may be been the art person I had known the longest in the shore area. 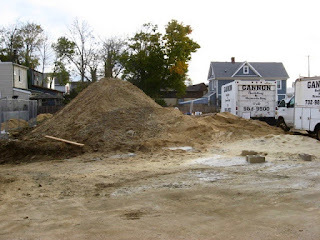 I first moved to the region in the winter of 1996, to become the caretaker of a mostly empty house. I was not even a year out of grad school, and was aware that many of the people I had gone to school with in Illinois were teaching at colleges in the midwest. Some had literally walked up to nearby colleges, asked for a position, and gotten it. When asked why I hadn't gotten such a job yet, I would tell people that New Jersey just didn't work that way. But at times I wondered if I hadn't given it enough effort. So on a spring day when I had nothing else on my schedule, I decided to look into the state of local colleges. No previous contacts or appointments, just drove around, investigated, met who I met. 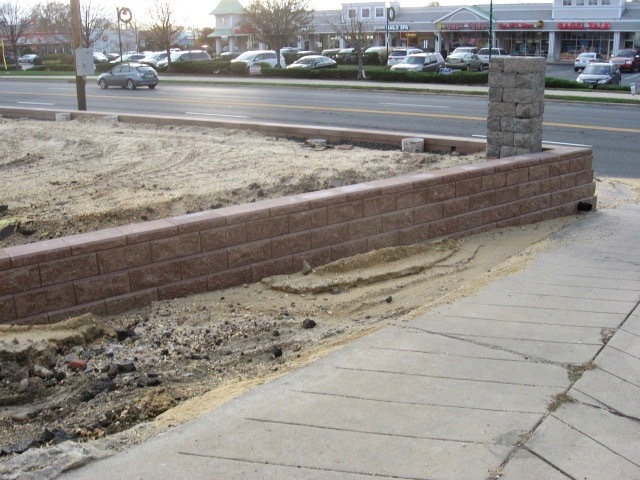 Two colleges here in Monmouth County, and two in nearby Ocean County. With nothing more than my maps, I set out. Didn't find much at Ocean County College- just a few cluttered messy classrooms. Later I would learn that the school actually had a print studio, but it wasn't active at that point, and never would be again. My visit to Georgian Court would be a bit more productive. Actually found a printmaking professor and studio classroom. There was no opening, but thanks to that contact I would eventually get to do a few lectures (paid appearances) and had two solo shows in their gallery. Then on to Monmouth County and Monmouth College, where I met the faculty member who taught printmaking, who was excited that computers were used for much of it, so no future for me there. My last stop of the day was at Brookdale Community College (Monmouth's county college), where I was told there was no printmaking class, but if there ever was, there was someone who would be teaching it. I decided to hang around and meet this person, and eventually he showed up and I met Doug Ferrari. Got no teaching job that day (I eventually started working at OCC, the one school where I met no one that day), but I learned a bit. I became reacquainted with Doug at SICA (The Shore Institute for Creative Arts), an organization he helped to found. 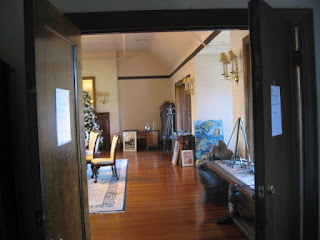 A large old building in Long Branch that had served many purposes over the years had been repurposed as an art center. A huge raw exhibition space, a large storage/work area. a cafe for performances, small studios available for rent. I participated in one of the early shows there, but came back annually to check out the "Fresh Meat" shows- exhibitions of recent graduates from various New Jersey colleges. A bunch of the young artists renting studio space there became regulars in the critique group that met at my studio. When OCC decided to replace its old art building and officially get rid of its print studio, all that equipment ended up at SICA, perhaps due to Doug's interest in printmaking. Unfortunately, his love of art didn't necessarily translate into economic success, and after several years, the board decided to sell their large Long Branch property. It was reestablished in Asbury Park, a few blocks up Cookman Avenue, a relatively short walk from the Studio. Much smaller location, no room for the rental spaces or the planned print studio (the equipment was redistributed to individual artists and such), but the cafe and exhibit space would be there. I helped paint the space (in exchange for some free pizza) and saw a few good shows there. But I guess the money ran out again, and word got out that the place would be closing. I stopped by for a last visit, and Doug requested that I send him some digital images of prints, for a show that he might be involved in putting together. And then SICA was gone. But soon I would hear from him again, that show he was putting together, which turned out to be at his new job, assistant director of the Arts Guild of New Jersey. That turned out to be a renamed version of the Rahway Arts Guild, a municipal art/education space in the downtown area and a place I had participated in a print show several years earlier, so I knew how to find it. This new show was not strictly a print show, but had a theme of "Preemptive Strike"- a spring invasion of Jersey shore artists into North Jersey before all those people came down for the summer. A decent show, but recent years have been tough for arts all over, and a few years ago, the Arts Guild of NJ announced they were cancelling programs and classes and ceasing operations. I never did see him again after that show four years ago. I wouldn't say that we were particularly close, but he was a presence in my art life for nearly two decades. He was responsible for some exhibitions that I was part of, and I admired his dedication to the goal of bringing some of the New York style art experience to Monmouth County. I don't know if the eventual failure of art organizations he was involved with was at all his fault or more the economics of the times. But he kept trying, so I'll respect him for that. A rare day when I had no place I had to be, so I eventually went up to the Studio. However I don't even have a project to work on right now. Been doing some consulting on organizing a local print show, and this past week I covered printmaking for my Intro to Art class, and Molly and I are hatching plans for a return of the critique group, and I've given some thought to my holiday card for this year (but I never show that here until Christmas Day), plus working with various college students, but no new project since I finished my mermaid prints a few weeks ago. So I wasn't cutting or printing today, but there's always work to do. One such task was to empty out some stuff from car and to bring it into the Studio. Back in the summer I had a class in Belmar, and I've been toting around a lot of those materials in my car ever since. Car will be due for servicing soon, so I may as well clear out some of it. So a crate full of printing tools, a bunch of inks, and pieces of wood are now in the Studio and can stay there until needed again, which will likely be there in the Studio anyway. As I entered the building, I noticed a Christmas tree was up in the hall over by the stairs to the 2nd floor, and lots more Christmas stuff stacked up all around the lobby, ready to be installed, and here it is not even a week since Halloween. The office door was open so I asked about all this and was told it was part of an effort to get the whole building done by the end of the month. We still have a lot of November left, so I assume they will get all the trees and stuff done, but that reminded me of the new back lot. When I first noticed work going on back there I asked about that and was told that it was the process of finally paving and otherwise improving the back parking lot, and there was a goal of getting it done before all the Christmas shows. 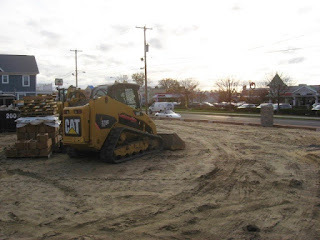 A lot of work was rapidly done- tearing up bits of old pavement, knocking down the old retaining walls and replacing them with new ones, evening out the sand layer. but to my eyes it doesn't look like much has happened in recent weeks. Still, I have nothing of my own to show, so here's an update on what's happened back there. We do have a lot of sand, but I don't think I want to park on this until we get something more stable to drive over. I'm not sure what's going on with this new driveway entrance. The angle is attractive, but the width at the bottom of the ramp is the same as it always was, so this is not going to allow for two lanes. Maybe there will be some small parks installed. 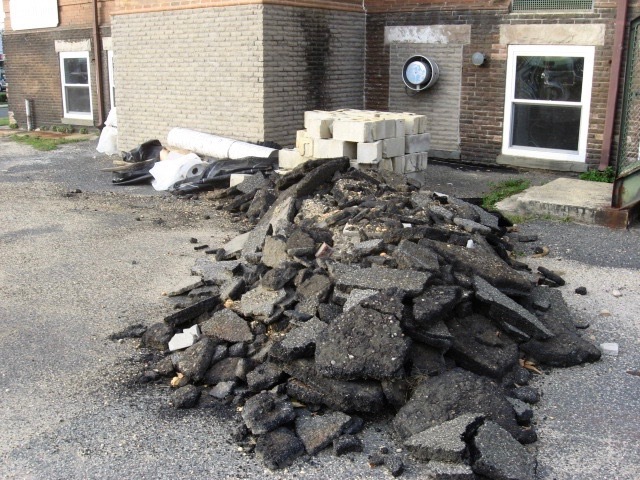 They did tear up a lot of old asphalt, so that's something. Let's hope there's something more exciting to report next week.